No matter the season, there is never a wrong time to visit Interlaken, Switzerland. I once heard that if you are bored in Switzerland, you are doing something wrong. And how true that is. Whether you completely indulge yourself in cheese fondue and Swiss chocolate, hike in the majestic Swiss Alps, kayak on crystal clear blue lakes, 0r paraglide over the charming town of Interlaken, there will always be an endless supply of opportunities for you in Switzerland. Awaiting your travels is the enchanting town of Interlaken, nestled smackdab in the middle of the Swiss Alps and right between Lake Brienz and Lake Thun, giving Interlaken its name - a town between two lakes. Your excitement for visiting Interlaken, Switzerland is probably through the roof right now and it’s about to reach outer space because not only is the town itself amazing to explore, but the flight into Interlaken is indescribable. I am at a loss of words to explain how beautiful and breathtaking this flight is, so let me go ahead and attempt to describe its beauty to you. A departure from Prague will lead you directly over Eastern Czech Republic and into Germany where you will see anything and everything from metropolitan to countryside towns, beautiful snow-capped mountains, and lushes valleys and meadows. If these views don’t make you want to jump out of your seat and explore the very awaited town, Interlaken, then make sure your seatbelt is secured nice and tight because the flight into Switzerland definitely will. 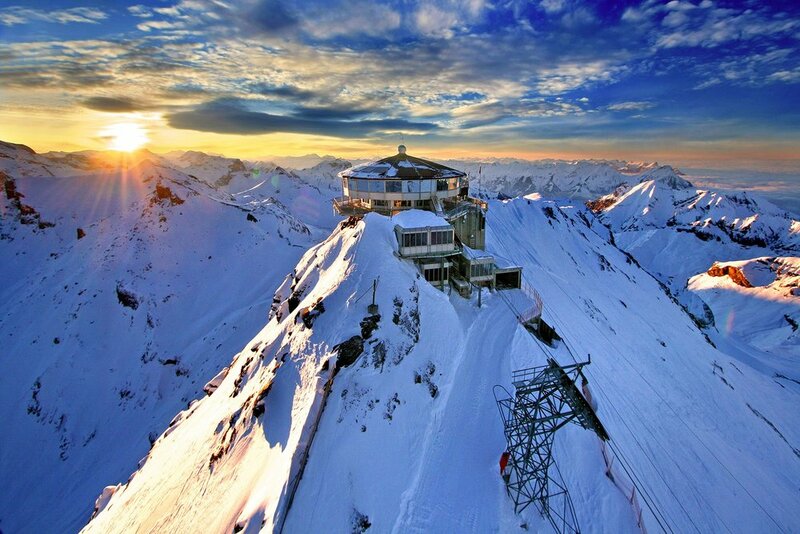 The Swiss Alps are commonly referred to as “the mountains of mountains”, where you will be completely blow away by not only the views, but the countless things there are to do once you arrive. Anyway that you get into Interlaken will be beautiful, but flying will give you a view that you will never be able to experience through any other mode of transportation. Right before you land in Interlaken, you will fly over Lake Brienz and Lake Thun. Grab your camera and don’t stop clicking because you will never want to forget this view. Surrounded by the spectacular mountain backdrop, lushes green meadows, and the completely sensational blue waters is Lake Brienz and Lake Thun. Hopeful to see and do more, exploring Interlaken will not disappoint. Whether you want to explore by foot, by paragliding, or by kayaking, there is something for everyone. Let’s start by getting lost in the mountains by hiking Harder Klum. You will never feel so accomplished by this climb and astonished by the view that awaits you. During the hike, make sure you look up, down, and all around. Why? Because those people floating in the air is your next adventure, paragliding. Forget your fear of heights and take that leap of faith and run off the mountain, with your trusty pilot of course. Before you know it you are sitting comfortable with your feet dangling and mouth wide open taking in the beautiful town of Interlaken, Lake Brienz, and Lake Thun. Now that you have seen Lake Brienz from a bird's eye perspective a couple times, it’s time to see it from on the water. It’s hard to choose which activity in Interlaken is the most rewarding, but kayaking is definitely right up there. You can either take a couple hour trip on the water and be left speechless by the beauty of the water and everything around you or you can extend you kayaking adventure to an overnight trip and kayak the entire lake. All 14 kilometers of Lake Brienz is home to some of the cleanest and clearest water. You can drink right from the lake. So go ahead and fill your water bottle up and enjoy that mineral filled and refreshing crystal clear water. Maybe you need a break from being a daredevil. No worries. Take a walk around the city of Interlaken and enjoy the beautiful mountain views along with the charming stores and buildings you will pass on your walk. Soon you will become overwhelmed by the delightful smells of Swiss cheese and chocolate. Indulge in some of the best melted, warm, and savory Swiss cheese fondue. Trust me, it will be worth the money and calories. I bet you will want another serving, but don’t over do it on the cheese fondue because you can’t forget about your sweet tooth. Head over to the Funky Chocolate Club and before you know it you will be dipping bananas, strawberries, and pound cake into silky and sweet Swiss chocolate. No matter the activities you to do or delicious foods you eat in Interlaken, you will be completely overjoyed and ecstatic by what Switzerland has to offer. As one of the most beautiful places in Switzerland, Interlaken will leave you wanting more and don’t worry it won’t leave you hanging. There is always something for you to do no matter the time of year. So make sure to take everything in that it has to offer and then come back again to fulfill that adventurous spirit you have.